Last week I was talking to my mum about how much I wish I had a walk-in closet. “You do have one,” my mum replied. “It’s called Zara.” Whoops. Well, I guess I DO spend a lot of time there, but hey, it’s for research purposes, I promise! 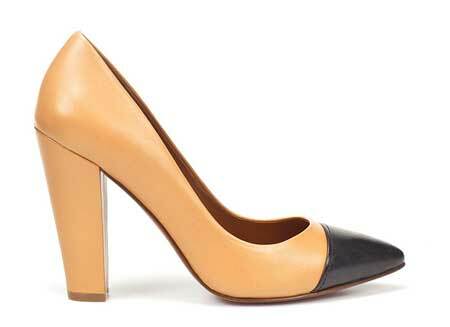 Today, my, er, “research” has uncovered these tan and black toe-cap pumps, which have – yes, I know – a pointed toe. Lately, though, I’ve been in the market for some pointed shoes. I know that will shock, and probably horrify, some of you, but I’ve been wearing a lot of cropped trousers recently, and I actually think they look better with pointed toes, which create a more elegant look. Rounder toes just somehow don’t look right to me (on me, I should stress) with crops, and so the search is under way. When it comes to pointed toes, though, it’s all in the length. A very long toe, for instance, still looks very dated to me, and isn’t something I’d wear. A shorter point, however, like this one, still looks pretty classic, although the chunky heel also helps bring these up to date. Finally, the colours are that “go-with-most-things” tan and black: probably why I keep on looking at them every time I visit the Zara website. Which is hardly ever. Honest. 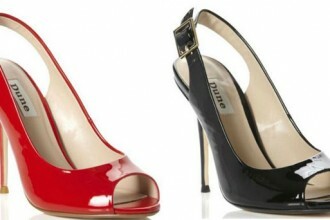 I don’t like these quite enough to pay £49.99 for them, but if they end up in the sale, then I could well be tempted. If you’re tempted NOW, you can click here to buy them. Fabulous. I don’t mind a pointed toe. zara will soon have online shopping available in the US and I can’t wait to finally be able to buy all the Zara shoes you blog about! I think I would like these a LOT if it was a colored upper with a sparkly toe cap…hmmmm, how about royal blue with silver?